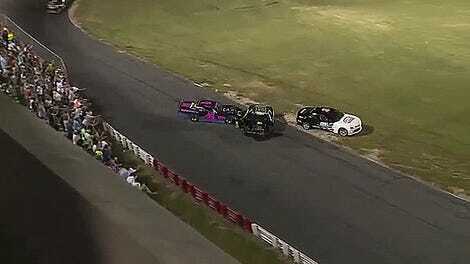 It’s impossible to determine the craziest part of this figure-eight racing fight from Anderson Speedway in Indiana. It’s just a magical cornucopia of race car belligerence that must be appreciated in its entirety. It ends with one car on top of the other, one driver getting tased and both drivers involved getting arrested. 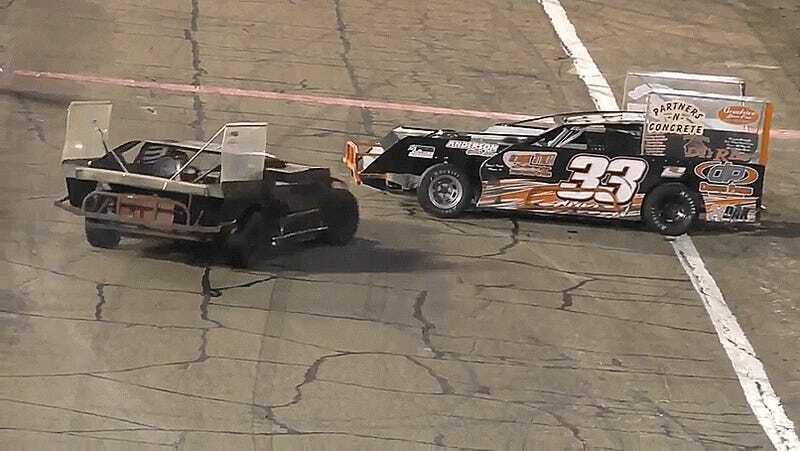 The second to last feature race of this weekend’s Stock Car Festival started off with this unbelievable fight. 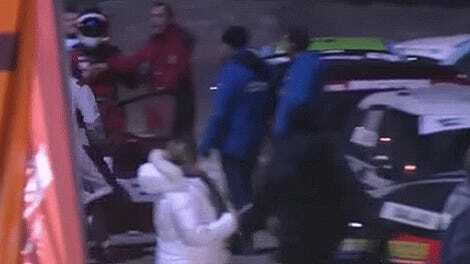 The two drivers who eventually got in the big fight collided with each other three times in only a couple turns of the figure-eight course, according to The Herald Report. 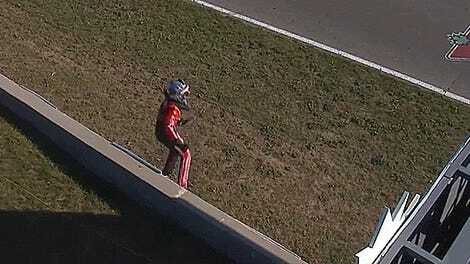 After getting spun out by the black and orange No. 33 car’s driver Shawn Cullen, the driver of the numberless all-black car, Jeffrey Swinford, drives right over the No. 33's hood to retaliate. Then the fight was on. Cullen climbed out of the No. 33, took off his helmet and started throwing punches at Swinford, who was still sitting in the other car according to WISH. Swinford never left his race car during the fight. Cullen is 42 and Swinford is 40, WISH notes, so not only have they reached that age where they can rant about being men in Big XII press conferences, but they ought to know better by now. You’re men! You’re 40! You’re not kids! You can’t just throw your Hot Wheels on the other dude’s Hot Wheels anymore. Folks could get hurt. Police came over to break up the fight, tasing Cullen in the process. Both drivers were eventually taken away in handcuffs. Cullen was ticketed for disorderly conduct, and Swinford was charged with Class A misdemeanor criminal recklessness. Swinford was released from the Madison County Jail after posting a $3,000 bond early Sunday morning, reports The Herald Report. Swinford will not race at this racetrack as long as I own it, and I plan to own it for a long time. “Beyond my comprehension” is a nice summary of what happened here, come to think of it.